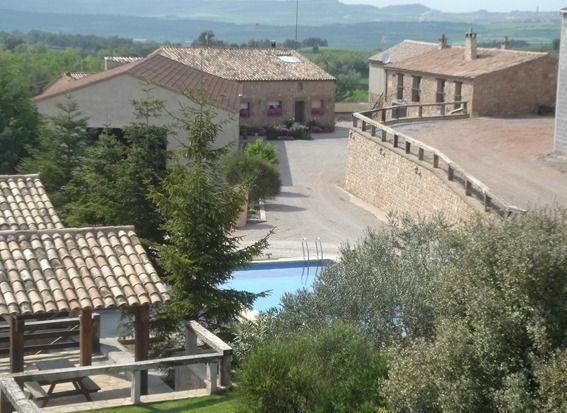 In Can Bartomeu, right at the heart of Catalonia, you will find the peace and quiet you have always dreamt of for your holidays, just one hour from Barcelona. Can Bartomeu includes two semi-detached independent farmhouses in a rural environment, 4 km from Els Prats de Rei, with a very wide panoramic view. The houses lie in a quiet area with easy access, 735 m above the sea level. Can Bartomeu is part of an agricultural/cattle-raising farm, surrounded by cereal crops and pine, holm-oak and oak woods. Rural construction from the turn of the century with stone walls, leaning roofs, wooden beams and a very well chosen decoration with traditional fittings, which create a really cosy and fine environment. - The rural accommodation Can Bartomeu used to be used for keeping forage and straw for the animals working the land in La Pallera, and for keeping cereal resulting from the harvest in El Graner. These rooms were after some time rendered useless. In 1.996 and 1.998, respectively, the building was renewed to offer two rural lodgings, respecting the typology of the area and preserving the family heritage. - La Pallera with capacity for 5 people has 1 double bedroom, 1 triple bedroom and a sofa-bed for two in the living-room. - El Graner with capacity for 5 people has 1 double bedroom, 1 triple bedroom, 1 supplementary double bed and a sofa-bed for two in the living-room. - Both houses are fully equipped with fire place having grill and firewood, central heating, fridge, washing machine, oven, all the cooking appliances and a bathroom. Information on the area and table games are also available in the house. - There is a private swimming-pool in a spacious garden area with garden furniture, wooden pergolas as well as a small children´s playground with swings, see-saw and a sand-pit. On a next-door building there is a play room with table football and table tennis. There is a parking area right in front of the houses. - Coal portable BBQ. - A number of routes can be taken from the house, ideal to enjoy the landscape of the area. Near the GR-7.1 foot-path. Tuvimos una estancia perfecta. Nos alojamos una semana con los niños y lo pasamos en grande. Los propietarios muy agradables y dispuestos a informar sobre las fiestas y actividades de la zona. Muchas gracias por todo! Volveremos! Recomiendo la casa por su situación en `plena naturaleza,el entorno muybonito para el paseo y a la vez para visitar los pueblos más cercanos,prat del rei calaf.La casa super acojedora tiene de todo en menaje de cocina,es super calidad y comoda,la unica pega por decri algo son las camas que no superan el metro 30 y para personas altas y grandes como nosotros son un poco justas,pero lo demas compensa este detalle. La he visitado 6 veces con los amigos la primera vez sin niños pues eramos muy jovenes y ahora que todos somos padres por partida doble disfrutamos de ella muchisimo más la prueba esta que volvemos. La piscina y su entorno maravilloso,una sala de juegos super comoda y los dueños maravillosos,se nos ha hecho el fin de semana super corto,animo a visitarla. Esta vez organizamos una gimcana,lo pasamos super bien. Accueil très sympathique des propriétaires qui parlent très bien français. Lieu très calme, la location El Graner est vaste et agréable. La piscine est très bien. Seul inconvénient les odeurs des porcheries situées sur l'exploitation.